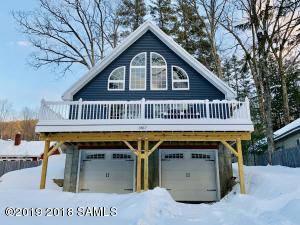 Brand new 3 bedroom 3 bath custom chalet w seasonal views of the lake & walking distance to Ushers park, beaches, docking dining and all of the village fun! Great entertaining home w soaring knotty pine ceilings, open kitchen dining & living room that leads out to huge deck for dining. 1st floor master suite w luxury bath as well as additional bedroom & full bath & laundry. 2nd floor has 3rd bedroom and another full bath & open area for office or sitting area. 9' ceilings in basement that can be finished for additional family room or den. 2 car garage & nice back yard for the kids & pets. Great year round or vacation getaway! !